Cineworld is the UK’s second largest cinema operator with over 800 screens in 102 cinemas. Cineworld has the World’s tallest cinema (Glasgow, Renfrew Street) and the largest by number of screens in the UK (at Sheffield Centertainment). Where can I check my Cineworld giftcard balance? You can hand over the card at the box office or food outlet in any Cineworld cinema and the team member will check the balance for you. You can call Cineworld on 0333 003 3444. Calls are charged at regular geographic rates and will be included if you have a call package. This telephone number is operated by Cineworld. Where can I buy a Cineworld gift card? You can purchase the giftcards at Morrisons and Sainsburys, and also online from the Cineworld website. Note there are postage charges starting at £1.50 for ordering online. Where can I spend my Cineworld gift card? 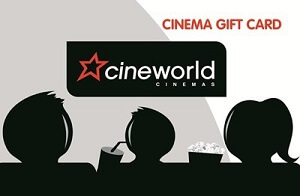 You can spend Cineworld giftcards at the box office and on food and drink at any Cineworld or Picturehouse cinema in the UK. Zeek regularly have Cineworld gift cards at up to 20% off! So before you book your tickets, check out this page at Zeek and you could save yourself a pretty penny! Delivery from Zeek is instant (email or app) so don’t hang around.